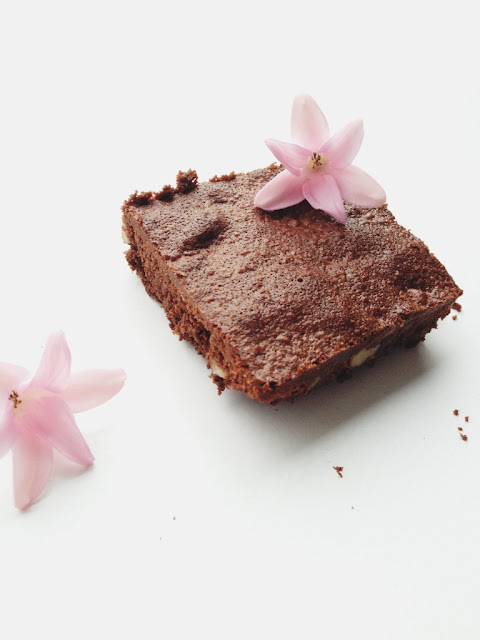 They are many recipes for brownies, but I love this one because it's very simple and quick to make. 1. Preheat oven to 190 degrees. Grease a baking pan of 23 x 23 cm and line it with baking paper. 2. Break the chocolate into pieces and put in a hot water bath or in a heatproof bowl over, but not in, a pan of boiling water. Put the butter and let it melt. 3. Beat the eggs and sugar with a mixer and pour it over while the motor is running, the chocolate mixture and, if used, the liquor slowly by. Leave to cool slightly and then add the flour and hazelnuts there. Mix with the mixer. Join finally the white chocolate flakes and fold there briefly through. 4. Pour mixture in the coated baking pan and bake 25/30 minutes in the oven, or until just solidified. Remove the brownies from the oven and let them cool in the tin. Ik zag hem net via Instagram, maar hier ziet hij er nog lekkerder uit:)!!! Ook een prachtige foto! Ziet er heerlijk uit! Bedankt voor het recept:). Wat mooi op de foto gezet! Nog bedankt voor je reactie op mijn blog, had de jouwe nog niet gezien maar ik ga je volgen!